With more than 7,000 subscribers and 1.7 million views on their YouTube channel, General Finishes is no stranger to video marketing. A Wisconsin-based company, General Finishes manufactures wood coatings and is a recognized leader in water-based technology for wood stains, paints, topcoats and floor finishes. For years they have been producing long-form videos to introduce their products and teach customers how to use them. Recently, General Finishes added something new to their video mix: top-down video. Seeing a need to provide shorter, yet illustrative how-to videos, General Finishes ramped up video production, incorporating the top-down style. Christine Adams, owner of Concept Design Group, General Finishes's marketing agency, produces an average of 25 videos per year for General Finishes as part of its overall marketing strategy and is on track to hit 100 videos by the end of 2018. "Video is a top priority for General Finishes; it is criticial to driving end-user sales to our distribution channels. We belong to several Facebook groups, where we find inspiration from frequently asked questions. The feedback is prioritized and used to create a video strategy for the entire year," says Christine. When it comes to budgeting for the scale of videos they produce each year, Christine advises careful planning and bulk shooting is the "only way to go." Producing in bulk drastically reduces the cost per video. Depending on the complexity of the content, they typically plan for 2-3 days of shooting and a full week of editing, with several months of advanced preparation. "Our social media strategist and creative director brought this idea to my attention and we all knew it would be popular with our audience, mainly comprised of GenX and Babyboomers. In addition to the social engagement metrics we track, our retailers frequently share feedback from their customers who've mentioned watching the videos online. At the end of the day, we measure increases in sales. We know it's working." Each YouTube video is optimized with an end screen and description driving viewers to the General Finishes Design Center for design ideas from customer-shared projects, or to www.GeneralFinishes.com to find nearby retailers. Meet the crew: Producer, Bruce Gibb; Director of Photography, Bob Gregory, Jason Klappa; Editor, Eric Conley. Point-of-view style videos are not a new trend. Broadcast veterans will tell you they've been around for decades. What is new, however, is the accessibility and priority that social media platforms place on video coupled with the self-starter mentality of the Millennial generation. "Forget books and instruction manuals – millennials have video," according to Matt Anderson. He's a video marketing contributor for Think with Google, a resource for high-level data, analysis and marketing insights. 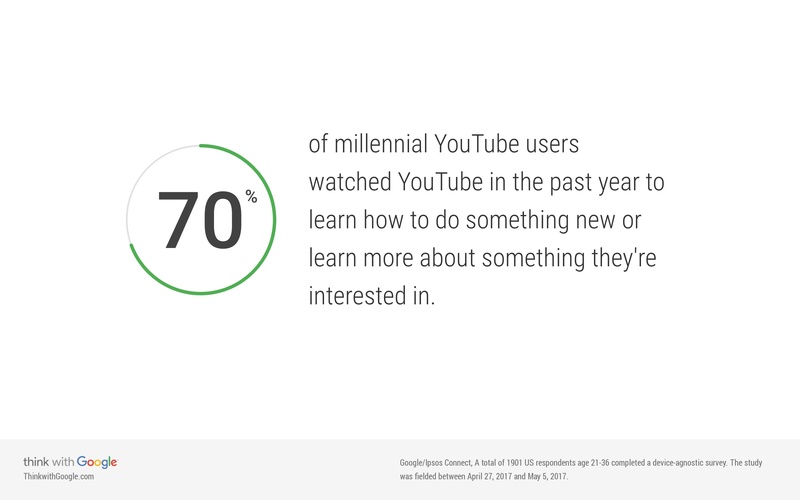 The company surveyed 1,900 people and found that, "when learning something new, millennials are 2.7X as likely to prefer to do so by watching a YouTube video compared to reading a book." Not only is this top-down approach a perfect match for the how-to videos that millennials love, the short format (typically 30-60 seconds) makes everyday tasks look quick and easy. Earn brownie points if your video can be watched without audio. That way you can avoid waking others while checking your Facebook feed at the crack of dawn. If we've learned anything from General Finishes, it's that top-down videos are not just for tasty recipes. If your product or service caters well to the how-to genre, consider mixing it up with a new point of view for your next video project. Blog: Profit from episodic content?